The prospects for this year's grouse shooting season, which has just begun, are said to be "unusually favourable". Landowners and gamekeepers across Scotland are reporting that the mild spring and warm summer have resulted in high grouse numbers. But conservationists are using the start of the season to highlight the illegal persecution of birds of prey. They have claimed sporting estates and politicians could do more to end the practice. Tim Baynes of the landowners' organisation, Scottish Land and Estates, said: "We got a nice dry spring, then no horrible weather through the hatching period in May. "Everyone is optimistic for a very good season." Depending on your view point, the start of the grouse shooting season may or may not be described as "glorious". For Scotland's sporting estates and the gamekeepers they employ, the twelfth of August is one of the most important dates in the calendar. They use the occasion to hammer home the case for grouse shooting, citing benefits for the rural economy and wildlife. But their critics, and there are many, will not find the "Glorious Twelfth" a cause for celebration. Instead, their focus will be on the illegal killing of birds of prey, for whom the red grouse is a valuable source of food. Landowners and gamekeepers' leaders condemn raptor persecution. But the killing continues and so does the controversy. The Scottish Gamekeepers' Association (SGA) is highlighting research which suggests the sport is worth around £32 million to the rural economy. SGA chairman Alex Hogg said: "A good season for sporting visitors helps the small rural communities, the tourism businesses, shops and retailers that require the cash injection as we head into the less seasonal months." The grouse shooting season is beginning against a backdrop of ongoing controversy over the poisoning, shooting and trapping of birds of prey. Scottish Land and Estates and the Scottish Gamekeepers' Association have repeatedly condemned raptor persecution. But environmental groups say they must do more to stamp out the practice. 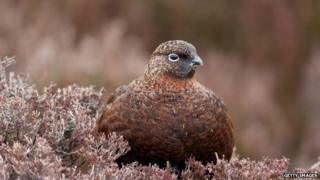 Meanwhile, the high street retailer, Marks and Spencer, has said it will not stock grouse this year because it can't secure sufficient numbers of what it calls "responsibly sourced and third party accredited" red grouse. The Lush cosmetics chain has been inviting its customers at stores across Britain to sign a postcard to the Queen, calling for action to protect the hen harrier. And the League Against Cruel Sports has called on the tourism agency VisitScotland to end the promotion of Scotland as a destination for driven grouse shooting. In response, VisitScotland said it must remain impartial and could not "discriminate" against one section of the tourism industry. The environment minister, Paul Wheelhouse, told BBC Scotland News: "The model of a shooting estate is changing in the 21st century and there is considerable potential for closer alignment of conservation and sporting interests than in the past. "This is why we support the independently accredited Wildlife Estates Scotland scheme which, I hope, can in future signpost those intending to participate in a shoot to the growing number of estates that manage their grouse shooting or other sporting rights in harmony with wildlife, such as raptors - and steer away from the small number of operators who continue to harm our wildlife." The Scottish government is introducing a range of measures designed to tackle wildlife crime, including restrictions on the use of general licences where wildlife crime is suspected. It has said it will take further action if required.